In 1984 my then partner David Williams and I bought this unimproved block (then known as Lot 11 Wallaby Crescent) from its original owner Tim Crichton. 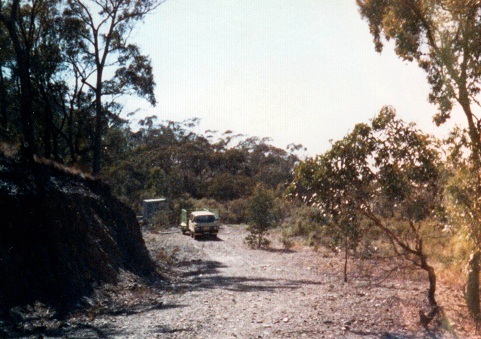 Tim had recently become engaged, and his bride-to-be was not enthused about living so far from Melbourne; bear in mind that the Calder Freeway did not exist and the Bushlands was then a two and a half hour drive from the CBD. Our immediate neighbours were Steve and Helen Key, who later sold their property to Tim Ford and Annie O’Shannessy. Uphill from us was one of the original residents, Laurie Leslie. Also resident close by at that time were Ken and Meg Savage, Sandra Watson and her partner Hans, Peter and Susan Hellawell, Tony and Linda Cook, Jenny Higgs, Enid Hall, Ann Quinton and her grandson Paul, Ray and Nicole Lindstrom and Mick and Helen Melican. Purchase price of this property in 1984 was $9,500 – very reasonable in those days. A further $12,000 was then spent in buying and transporting an unloved 2-bedroom 1940’s weatherboard house from the Melbourne suburb of Mentone. 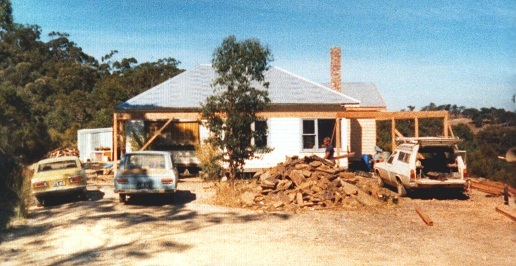 When David and I moved into the house in March 1985 there was no running water, no phone, no septic, no water tanks, no guttering, no verandahs, no dining room, no carports and no electric power. We survived via LPG, firewood, kero lights and an ice box. We loved it and never regretted what in later decades would become known as a “tree change”! Our septic was installed by local earthmover, identity and colourful character Kevin (Casha) Wilson and his son Joe. In 1986 Tony Cook built our chimney (and built it well!) and Mick Melican added the dining room, carports and verandahs, ably assisted by local men John McBride and Graeme “Bushy” Holden. In 1990, after some years of a deteriorating relationship, David and I went our separate ways. I stayed and he moved back to Melbourne, where he sadly died in 1991 of an alcohol overdose. Fourth generation Castlemaine resident Michael Kuhle bought into the property and moved in with me. We continue to live here quietly and harmoniously. 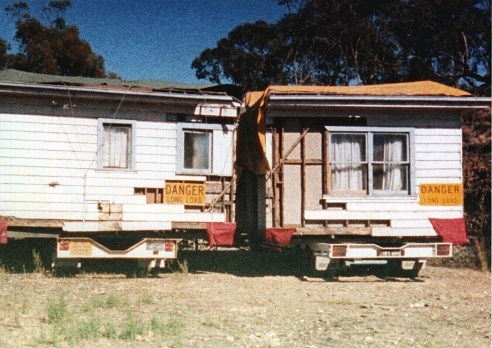 In 2002 we installed solar power and dragged ourselves into the 21st century “bushlands style” – electric lights, a decent sound system and home theatre. No more 12-volt TV run off the car! 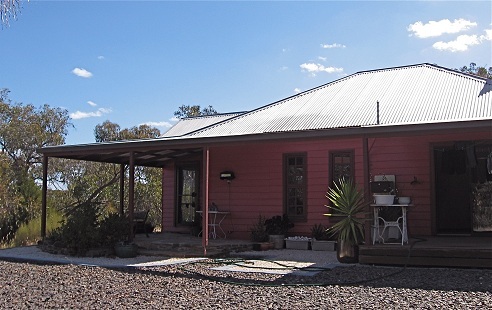 Also in 2002 I realised a secret and long held ambition – I finally got to paint the house watermelon pink! Life is good here and neither Michael nor I have any wish to live elsewhere. We drive past the Chewton Cemetery almost every day, and we know that one day we will remain there indefinitely! This entry was posted	on Thursday, January 31st, 2013 at 6:23 am	and filed under • Bushlanders, Our lot. You can follow any responses to this entry through the RSS 2.0 feed.